Something Silly for April Fool’s! The 1st April is a very very important day. Not only is it Sharky & George’s birthday (they’re 11 years old), it is THE most perfect opportunity for you to try out your very best practical jokes and pranks. -Choose your victim very carefully, older brothers, dads and friends are usually better than mums, little sisters and grandparents. -Remember that if you play a prank on someone, they are allowed to get you back. This is quite a mean prank that Sharky played on me when I was revising for exams in the summer. I had one of those electric fans to cool down my brain whilst I worked, and Sharky sneaked up and poured a whole packet of coco pops into the back of the fan. I was then covered head to toe in very fine coco pop dust! He had to do A LOT of clearing up! Before your teacher comes into the classroom, put a coin on the floor up at the front near to the door. Make sure you have a sheet of paper with you, so that when your teacher comes into the room, spots the coin and bends over to pick up the coin, you noisily tear the paper, so it sounds like your teacher has torn their trousers. 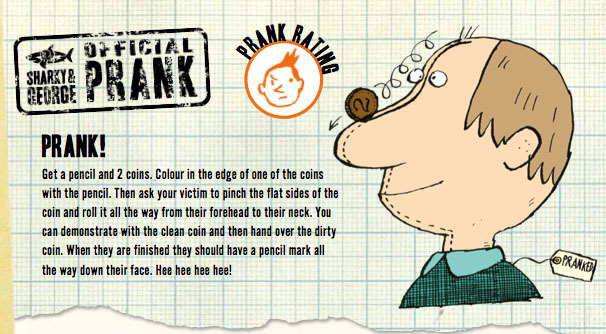 Tell someone that you’ll give them £10 if they let you crack two eggs on their head. Tell them that there are no hidden tricks. When they agree, crack one egg on their head, say thank you very much and walk away! Changing the clock first thing in the morning to trick my husband that it is 7am when it was actually 6am. One more thing to remember. On the 1st April check out the adverts in the newspapers, BMW normally do a really funny one.